A guilty plea to a misdemeanor, and no jail time. General David Petraeus has agreed to plead guilty to a misdemeanor charge of mishandling classified material and will serve no jail time for his actions. Let’s give the same deal to Edward Snowden. True, their crimes are different: Petraeus gave classified info to his biographer and girlfriend, Paula Broadwell. Snowden gave classified info to the American people. There’s another difference: as The Washington Post reported, Petraeus “initially lied to FBI investigators”—he told them he “had never provided Broadwell with classified information.” That was in an interview at CIA headquarters. Snowden in contrast told the truth about what he did, and why he did it. That was in an interview in Laura Poitras’s Oscar-winning film Citizenfour. 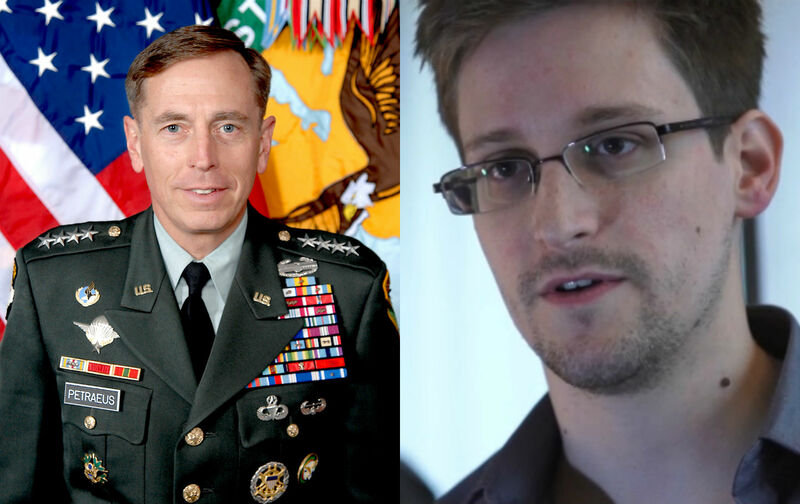 And there’s one more big difference: Snowden has done a lot more to defend Americans’ freedom than Petraeus ever did. In fact you might say Petraeus made America weaker as US commander in the Iraq war starting in 2007, a war that created more enemies for the US. Petraeus’s deal, as The New York Times noted, allows him to “focus on his lucrative post-government career” as “a worldwide speaker on national security issues.” A similar deal for Snowden would probably make him a worldwide speaker on national security issues, but without the “lucrative” element. I’m not the first person to make this suggestion: Jesselyn Radack wrote about it in Foreign Policy (and she credits Peter Maass in The Intercept). And while we’re giving Snowden the same deal that Petraeus got, let’s release Stephen Kim, who’s serving thirteen months in prison for talking to a Fox News reporter about a single classified report on North Korea. Let’s apologize to, and compensate, former CIA agent John Kiriakou, who served almost two years in federal prison from 2013 to 2015 for disclosing the name of a covert CIA officer to a freelance reporter—a name that was not published. While we’re at it, let’s punish the torturers, not the people who leaked information about torture.